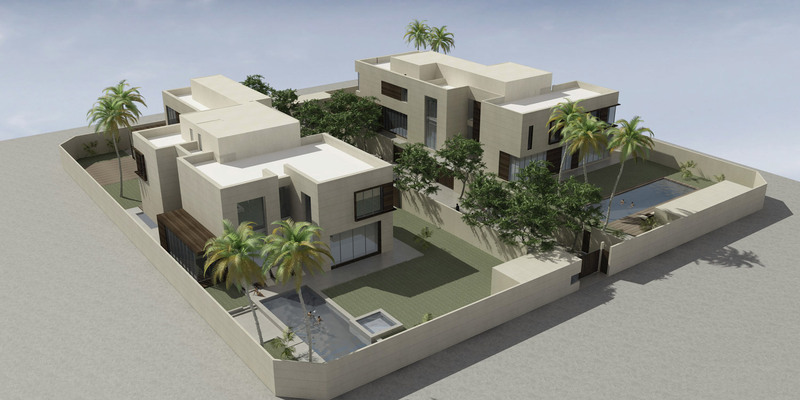 Our client requested two independent villas for his sons on this 3, 500 sqm plot in Riyadh, KSA. 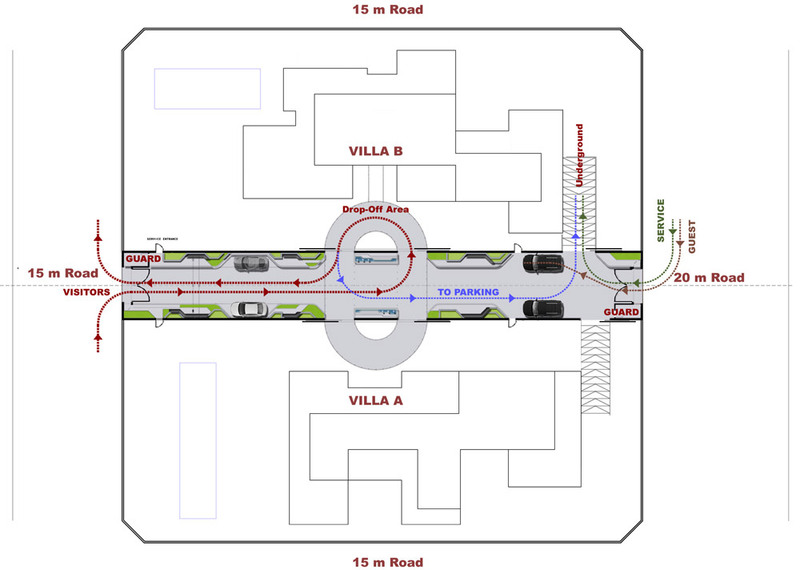 Given the configuration of the site and the four roads that make up its borders, accessibility and security were primary concerns for the client. 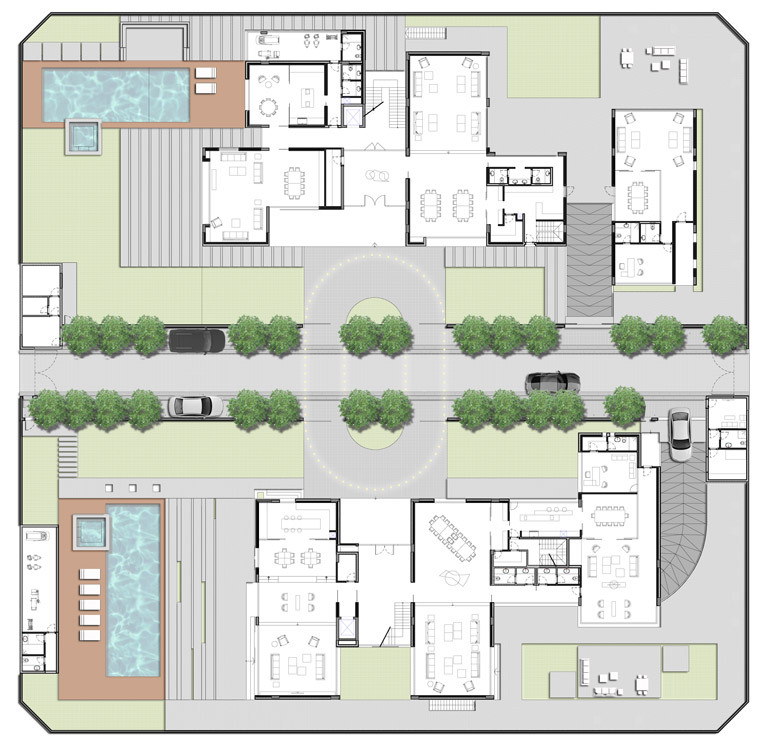 To avoid three different entrances for the family, visitors, and service, the mass plan was conceived as a compound with a private internal road, which serves the two villas. 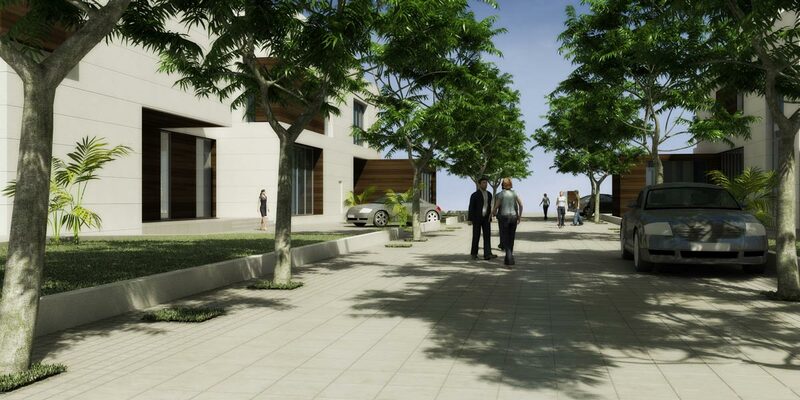 This internal road was also designed to act as a private landscape in which the residents of both villas could engage in outdoor activities such as cycling, jogging or simply relaxing in the shade of tree. 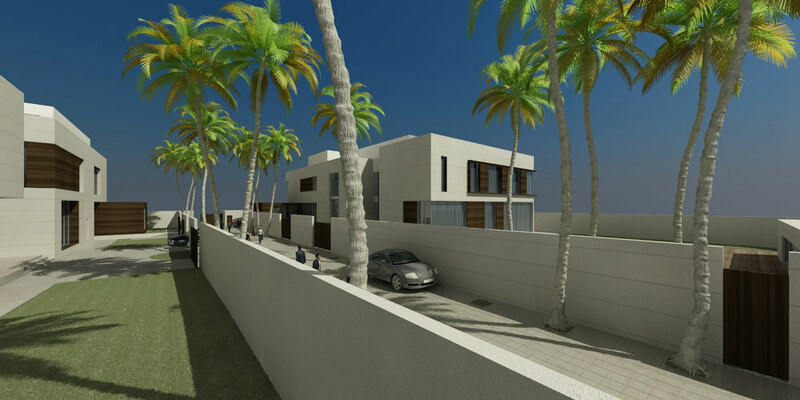 Each of the villas is approximately 1750 sqm and includes a swimming pool, gym, a traditional majlis, and generous living spaces situated in direct relation to the gardens. 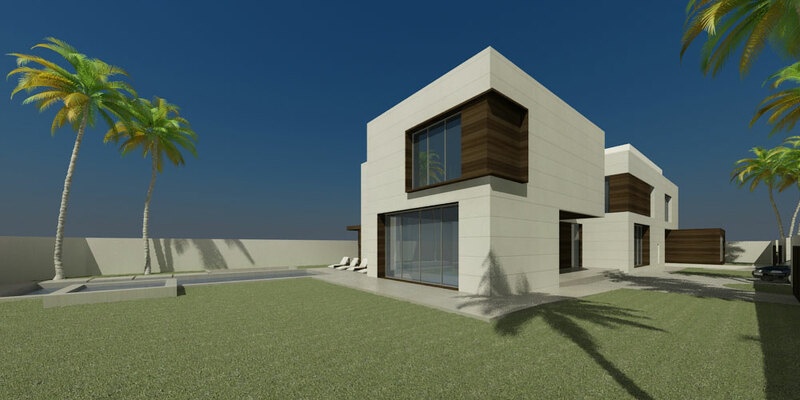 The overall volume of Villa PK is constituted of three distinctive blocks connected via the circulation spaces that reflect the distribution of internal functions. On the ground floor, the family area opens toward the private garden and swimming pool. The central block hosts the main entrance, and formal reception spaces. An office and ‘majlis’ are contained in the last block. On first floor, the different blocks define the parents’ space, children’s’ spaces, and family living areas. Service areas are located on the second floor. 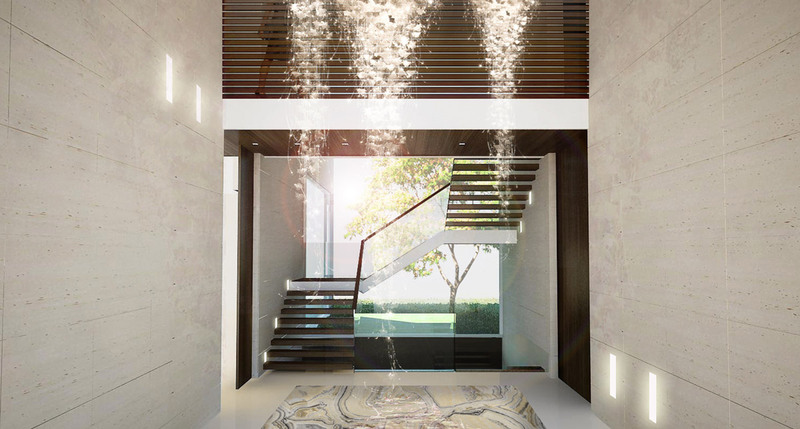 Villa PS is organized in a more scattered fashion with the circulation spaces connecting the different parts and functions. Stone, wood, and glass were used to create a diversified treatment of the façades. 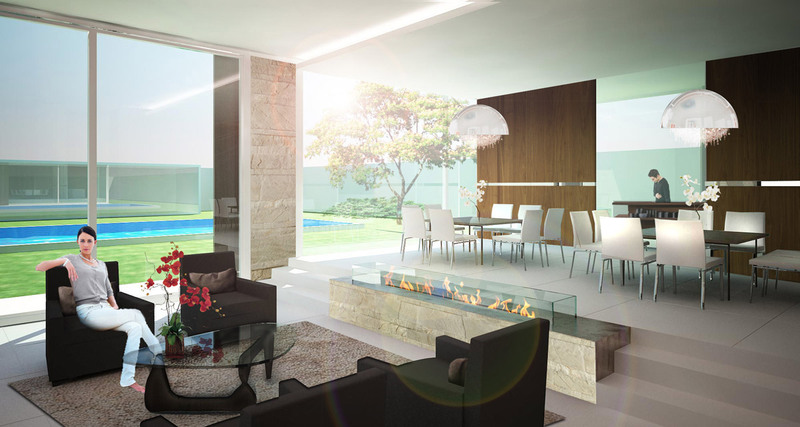 A glass façade on the ground floor frames the garden spaces for the living areas. The majlis space is visually detached by its wooden covering. Openings for the bedrooms on the first floor are minimized. Wooden panels are used to create privacy screens.